The inmates pace in their cells, carefully retracing the same path they’ve walked a dozen times before. It’s a habit bred from circumstance. Born in captivity, most have never known a life outside of their metal enclosures. Their only solace is the sun that finally cuts through the clouds, offering a brief reprieve from the icy winter air. Here, hidden behind a locked gate in a leafy suburb of Hobart, live some of the most notorious residents of Tasmania, long regarded as vicious thieves and killers. The guards warn me that while some may act timid others fully live up to their reputation. One thing holds true for the residents of the Taroona Captive Breeding Facility, though—none of the Tasmanian devils deserve their fate. 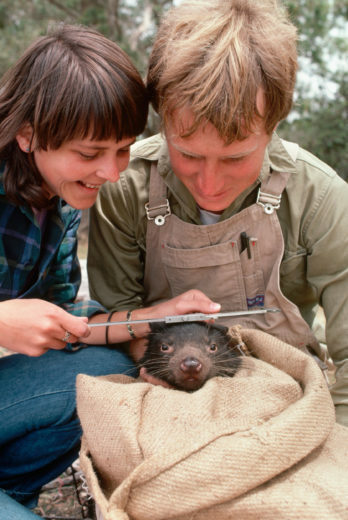 “When I started working on devils in the ’80s, nobody ever predicted that they’d be in trouble in such high numbers,” says David Pemberton, biologist and manager of the Save the Tasmanian Devil Program (STDP), an initiative of the Australian and Tasmanian governments. We watch as one of the inmates, “Berry,” emerges from her den and perches on a rock in the sunshine. She’s about the size of a small dog, with alert ears, a bear-like face, and a stout tail used for balance. It’s hard to reconcile the harmless-looking animal in front of me with the slobbering cartoon image that I grew up with. It’s also difficult to believe that a species so resourceful—one known for consuming everything and anything—is so close to extinction. Not long ago, devils were akin to raccoons in North America or wallabies in Australia—ubiquitous with the landscape and regarded as little more than pests that would steal and kill livestock and den under houses. Although the nocturnal animals were long extinct on mainland Australia, they were considered abundant throughout the island state. Then, 20 years ago, a devastating illness emerged. First reported in 1996, devil facial tumor disease (DFTD) is a rare and highly contagious form of cancer. It’s also fatal. Infected devils starve to death within three to five months; tumors grow on their faces and around their mouths, making it difficult for the devils to eat and causing their organs to fail. The effect has been catastrophic—within 13 years of discovery, the disease pushed the marsupials onto the endangered list. Officials estimate that the wild population has plummeted from 150,000 mature devils to as few as 20,000. But a new strategy may change that. The STDP, a team of scientists working in partnership with university and wildlife facilities, spent the last three years preparing for the mission that may ultimately save devils in the wild—repopulating the Forestier and Tasman Peninsulas with healthy devils. Located on the southern coast of Tasmania, the two peninsulas are connected to the mainland by only a narrow isthmus. The scientists hope that the geographically isolated and disease-free peninsulas will provide a safe haven for healthy devils to once again breed and thrive in the wild. It won’t be the first time in history that the Forestier and Tasman Peninsulas have been used to isolate a vulnerable population, though it may be the first time they’ve been used to protect one. 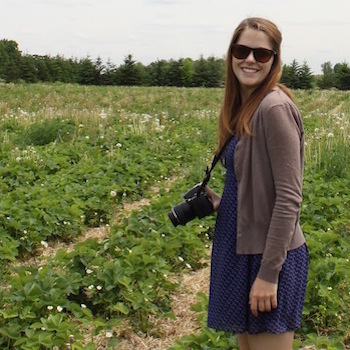 It’s a gamble—without a cure for DFTD, all that stands between the devils and their extinction is a narrow strip of land. A winding, undulating road lined by brilliant golden wattles, the official floral emblem of Australia, runs down the Forestier Peninsula and toward the tip of the Tasman Peninsula. There are few buildings and little other traffic—the 659-square-kilometer area along the southeast coast of Tasmania is home to only about 2,400 people who live in scattered villages. In these communities, connection to the land runs strong. You’d be hard pressed to meet a local who doesn’t quietly believe that the long-gone thylacine, or “Tasmanian tiger,” may still be out there. Like the devil, the predatory marsupial was considered a threat to sheep farming. It was hunted to extinction in 1936. Driving south, it’s easy to see how the valleys, dense with towering gum trees, have kept the legend of the thylacine alive. The thick bush also once helped imprison convicts—from 1830 to 1877, this was the site of Port Arthur, a large settlement for the British Empire’s “hardened” criminals. Like the Tasmanian devils, their reputation wasn’t necessarily warranted. Britain had low tolerance for reoffenders, even for crimes that seem petty by today’s standards—stealing a loaf of bread, for example. Two strikes and the authorities sent convicts to Tasmania; at Port Arthur they toiled in the burgeoning timber industry. “The isolation of this peninsula was part of the security and control of incorrigibles,” explains Colin Knight, a guide at Port Arthur Historic Site on the Tasman Peninsula, where more than 30 convict-era buildings remain intact. Much like Alcatraz, the famous island prison off the San Francisco coast, it was considered naturally inescapable; the site was chosen for its rugged coastline and unforgiving bush. The only link between the two peninsulas, which extend into the Tasman Sea, and the main island is a small two-lane bridge that crosses a canal at the town of Dunalley. Just south of this canal, on a farm along the northeast corner of the Forestier Peninsula, is where STDP released the first mob of 39 healthy devils of breeding age in November 2015. They’re the first devils to inhabit the area since 2012, when the existing wild population was removed. After two years of monitoring the peninsula, scientists declared it disease-free and ready for an influx of new devils. For the animals raised in captivity at facilities like the Taroona Captive Breeding Facility in Hobart, it is their first taste of greater freedom—and yet they’ll remain captive, contained by a series of artificial barriers. Although it’s less than 18 kilometers north of the penal colony, it would have taken days for prisoners to make their way along the steep shoreline—featuring the highest sea cliffs in the southern hemisphere—and through the tangled valleys of gum trees, thick clouds of insects, and massive rotting stumps to get to the isthmus. Many gave up and returned to Port Arthur. Others perished. For those who persevered, Eaglehawk Neck, with its low beach and lack of vegetation, would have seemed like a welcome refuge. That is, until they saw the dogs. Chained in place in a line, the mongrels were considered the guards to the underworld. With monikers like Ugly Mug and Tear’em, the dogs would erupt into a chorus of howls if anyone approached. Although few prisoners could swim at the time, dogs were even placed on platforms in Norfolk Bay to the west for added security. Like Port Arthur’s wardens, creating an impenetrable line is the goal of the STDP’s Peninsula Devil Conservation Project. At Dunalley, the first line of defense will be the existing Denison Canal, followed by an 800-meter electric fence that runs across the width of East Bay Neck. This connects to 200-meter intertidal fences in both Blackman Bay and Dunalley Bay. Finally, a steel beam set into the road will further deter devils—anything devil-sized or smaller will trigger a switch and the beam will vibrate. “Devils hate it,” says Pemberton of the motion. The artificial barriers at Dunalley will have little impact on other animals, he adds, though he does predict that STDP members may have to relocate the occasional spotted-tail quoll (a rat-like carnivorous marsupial) to ensure the genetic diversity of the species. The deterrents will not only keep the healthy devils in—they’ll keep diseased animals out. Until researchers find a treatment for the cancer, creating healthy, isolated populations of devils in the wild may be the only way to ensure the survival of the species. Two sweet faces peek out between the ferns in an enclosure at the Tasmanian Devil Unzoo, a wildlife park near Port Arthur and a partner of the STDP. It’s hard to imagine that devils could invoke the terror necessary to earn them names such as Beelzebub’s Pup. Yet, new prisoners and settlers at Port Arthur in the 19th century would have undoubtedly lain awake at night, scared by the screams of the devils echoing through the valleys—a devil’s unearthly growls and snarls sound like they belong to a possessed boar. The 10-kilogram animals, which are both ruthless scavengers and opportunistic predators, have the jaw strength of a dog four times their size. That equates to more pound for pound jaw power than any other animal on Earth. They’re also not very picky when it comes to their diet. They feast on the carcasses of wallabies and reptiles, hunt small mammals, and steal the eggs of birds. No piece of fur or bone goes untouched; even metal snares and echidna quills have been found in their feces. Their vicious bite is part of the reason that Tasmanian devils are now facing extinction in the wild. In addition to mating wounds, devils incur facial injuries through fights over food, which makes them more vulnerable to the highly transferable cancer. During these interactions, bits of cancerous tumor can crumble off and fall into the war wounds of healthy devils, or the disease is “injected” through puncture wounds when a diseased devil bites another. The foreign cells quickly take hold and grow, wrapping around peripheral nerves. The effect is often grotesque: the massive tumors that form can expand cheeks and fill eye sockets, rendering the animals unrecognizable. For those studying DFTD, the parasitic cancer is just as fascinating as the animal that it’s infecting. DFTD is one of only three known contagious cancers in the world. It’s also unique in that the devils mount no immune response. Initially, researchers hypothesized that this was because the cancer—which originated in one devil—creates genetically identical tumors in a population that lacks genetic diversity. But Hobart immunologist Greg Woods, working with University of Sydney researcher Kathy Belov, proved otherwise when they grafted skin from one group of devils onto another. The recipients’ bodies soon recognized that the foreign tissue had different DNA and rejected it. This proved that the problem wasn’t with the genetic diversity of the devils—it was with the cancer itself. As it turns out, although genetic similarity may aid in the transfer of DFTD, the big issue is that the cancer has the ability to enter the body unannounced. Mammal cells normally produce a molecular “name tag” with surface proteins, but in the case of DFTD, the proteins are inactive. Without a name tag identifying the cancerous cells as foreign, the body doesn’t recognize the threat and produce combative cells to destroy the intruders. The effect of this strange cancer is staggering. Researchers estimate that 90 percent of devils have been wiped out in more than 80 percent of Tasmania—only a few small, isolated populations remain unaffected. For islanders still regretful for the demise of the thylacine, the thought of losing their second most famous animal is almost too much to bear. In the 2000s, a rallying cry rose from Tasmanians to save the devil when reports of DFTD began to pour in. “A lot of the response to the devils comes out of our responsibility for losing the thylacine, and that can’t be underestimated,” says Pemberton. But there’s more than nostalgia at stake. Devils keep feral cats and foxes in check. The loss of the predator would irreversibly impact Tasmania’s entire ecosystem. As early as 2005, experts began to talk of separating the diseased devils from those on the then-unaffected peninsulas. But first, they relocated devils to Maria Island, a 115-square-kilometer island located just off the east coast of Tasmania, with the goal of establishing a free-living and DFTD-free “insurance” population. The island was selected for its proximity to the capital city Hobart, lack of people, and the space for a population of about 120 devils. Twenty-eight devils were transplanted to Maria Island during 2012 and 2013—the first to ever inhabit the island. Breeding followed, with each of the female devils raising up to four “imps” (pups) per year. The population has since grown to about 90, but at a cost. The devils have stolen eggs and attacked birds nesting on the island, including colonies of little penguins and Cape Barren geese, the latter of which were moved to the island in 1968 to protect them from predators after a drop in numbers. In 2014, purportedly not a single Cape Barren chick hatched. The STDP scientists predicted the risks and are building safer nesting burrows for the birds, hoping to find a balance between bolstering the devils and preventing prey species from disappearing in the process. However, Pemberton says that unlike Maria Island, the peninsulas are a natural habitat for devils. In addition to the Forestier newcomers, around 30 disease-free devils already reside on the Tasman Peninsula—it’s estimated that at one time the area held as many as 250. The newcomers will eat shorebirds and penguins, but their predecessors were doing so anyway, Pemberton says. Maria Island provided the STDP with valuable translocation experience and insight into breeding and feeding patterns; while there are over 600 healthy devils living in insurance populations in over 30 wildlife parks across Australia, Pemberton admits the STDP staff are still novices at learning how to transfer animals bred in captivity into the wild. The project will present new problems though, namely in how the devils interact with their human neighbors. The hungry new residents may target farms with chickens and lambs, and domestic dogs may attack the devils. That’s not the only concern. For all the money sunk into breeding the devils—maintaining the insurance animals costs over AUS $4-million every year—barely any time has been spent investigating the initial cause of DFTD, which seemingly appeared out of nowhere. In 2014, Jody Warren and Brian Martin, social science researchers from the University of Wollongong, released a controversial paper suggesting that DFTD might not be a contagious cancer at all, but potentially a reaction to environmental pollutants. Biologists initially suggested that pesticides used in Tasmania’s forestry industry (including atrazine, used to control grass and broadleaf weeds) and 1080 (a poison used to bait and kill invasive red foxes and feral cats) were the main culprits. While research has since demonstrated that DFTD is a transmissible cancer, the initial cause of the disease remains unknown. She’s referring to the elephant in the room. The STDP is managed by the Department of Primary Industries, Parks, Water and Environment—the same government department that manages commercial plantation forests in Tasmania. Tasmania’s forestry industry is most active in the northeast of the state, which is also where the disease originated. Finally, the STDP will continue to monitor the peninsula to ensure that it remains disease free. In addition to setting up a report hotline and surveillance cameras, they will routinely trap and inspect animals for signs of the disease and track them through remote barcode readers and microchips. Still, it seems a bit precarious to trust nothing more than a narrow sliver of land to save a species. After all, all it would take for the entire project to fall apart is one diseased animal to work up the nerve to brave the vibrating steel beam. For the species to truly be rehabilitated in the wild, the real hope lies in the research being conducted by Greg Woods at the Menzies Institute for Medical Research at the University of Tasmania. In 2015, Woods and his team began running trials for a vaccine that will help announce the foreign cells to a devil’s immune system. But a successful immunization program is likely still years away. While the scientists perfect the vaccine, the STDP’s work ensures devils will be around long enough to receive it. On my last day on the Tasman Peninsula, I follow the road from Port Arthur, driving further south to Tasman National Park. As I round the bend, the ocean spills open before me. It feels like the end of the world. I pull off the road near Remarkable Cave, a cavern that the sea has slowly pummeled into existence over the last 6,000 years, and think of something that Colin Knight, the historian, told me. For the devils, much like the first settlers of the Tasman Peninsula, maybe this place—their own little spot at the end of the world—is more than just a prison. Maybe it’s truly their chance at a new life. Cite this Article: Jessica Wynne Lockhart “Devils Go to Prison,” Hakai Magazine, Dec 14, 2015, accessed April 25th, 2019, https://www.hakaimagazine.com/features/devils-go-prison/.